Pittsburgh Penguins Acquire Barrie Colts Alumni Joseph Blandisi. #NHL #OHL - Very Barrie Colts | A website covering the Barrie Colts of the OHL. Today the Pittsburgh Penguins acquired Barrie Colts alumni and former captain, Joseph Blandisi from the Anaheim Ducks. In exchange, Pittsburgh sent Derek Grant. Blandisi was selected by the Colorado Avalanche in the sixth round at the 2012 NHL Draft. The team didn't end up signing him so he was later signed by the New Jersey Devils. He spent almost three seasons playing with both the Devils and their AHL affiliate, Albany/Binghampton Devils. On Nov. 13th of 2017, he was traded to the Anaheim Ducks. 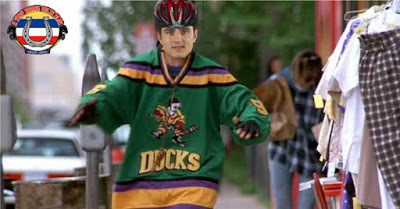 Blandisi played with both the Ducks and the San Diago Gulls of the AHL. In the AHL, Blandisi has played in 131 games between the Devils and Gulls. Over that time, he posted 33 goals and 67 assists for 100 points. Averaging .76 points a game, the forward also spent 215 total penalty minutes. Between the Devils and Ducks, he has seen 74 career NHL games. He has scored eight goals and 18 assists. The Penguins fans can expect a high energy player who will likely fit into the teams bottom six if he isn't sent to the AHL. Blandisi is a very fast skater who also plays with an edge. He has a great shot and does a great job of getting in the heads of opposing players. He also has the ability to score timely goals and has the skill to make them look pretty at the same time. And let's not forget about this spin-o-rama goal which earned him the play of the year in 2015. Before Yinz start saying "Well, this is in the OHL. We want to see production in the NHL". That is fair. Here is a goal he scored with New Jersey which was overtime game-winner. 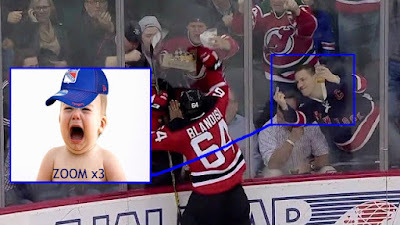 This goal also led to one of my favourite photoshops I have ever done on the blog. Blandisi was selected by the Owen Sound Attack 61st overall at the 2011 OHL Priority Selection Draft. He played 105 games there, posting 24 goals and 32 assists. 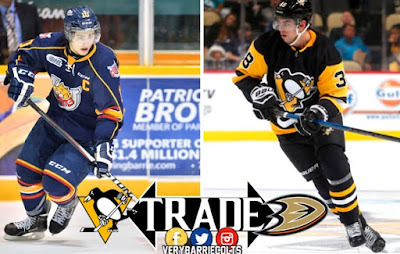 During the 2013-14 season, Ottawa traded Blandisi to the Barrie Colts for Erik Bradford and some draft picks. Blandisi spent a season and a half with the Ponies, totalling 78 games. In that time, he scored 55 goals and 70 assists. Blandisi played his final season in Barrie as an OA with the Colts in 2014-15. That season he posted 52 goals (most in the league) and 60 assists for 112 points. These stats put him on the top-10 list for all these categories among all-time Colts in a season. His 52 goals are the second most in a season, 60 assists are tenth most and 112 points is third. Blandisi also, as mentioned earlier was voted for the play of the year and won the leaguesLeo Lalonde Memorial Trophy which is awarded to the leagues overage player of the year. Blandisi's speed will be a nice fit for the Penguins. Like Tanner Pearson, Blandisi likes to shoot the puck and drives to the net very well. It would be interesting to see him play with some of the team's elite players and find out exactly what he can do. While it isn't known where he will start, Blandisi could end up being a strong piece for the Penguins moving forward.